You are here: Home » MEDIA » Books » Without Warning by John Birmingham (book review). 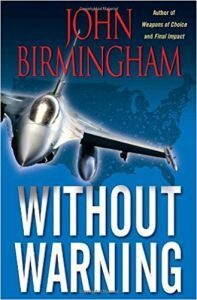 Without Warning by John Birmingham (book review). The cover of this book has the author’s name displayed in a large font with a byline of ‘Author of After America’ before the even bigger font for the title ‘Without Warning’. I thought this was a bit odd as ‘After America’ is the sequel to ‘Without Warning’. Perhaps the sequel ‘After America’ was a big smash hit while ‘Without Warning’ had been overlooked. Anyway, ‘Without Warning’ is both an exceptionally good book and for me, a disappointing one. The main story element of this book is that a wave of unknown energy suddenly appears covering most of continental North America. Every person under the wave disappears. In fact, it seems that all higher order life under the wave, birds, mammals, etc., simply disappears. Certainly nothing can be seen moving on the live feeds from the affected areas. To make things worse anyone who tries to enter the wave from outside appears to be vaporised. There’s a handy full-page map at the start of the book depicting what looks like a raindrop overlaying half of Canada and, most of continental USA. It extends southwards to cover all but the southernmost bit of Mexico and even covers the northern bit of Guatemala. It extends eastwards to cover half of Cuba and the Bahamas. The only bit of continental USA to lie outside of the wave is the area around Seattle in Washington State. There isn’t a lot of information about the appearance of the wave. It seemed to have appeared instantly and anybody caught under the wave just disappeared. This had consequences, as many of the people were driving cars, piloting airplanes, cooking and doing any number of things which required constant attention. When the people disappear, things quickly start to go wrong with catastrophic consequences. I should mention that the wave and the consequences of its appearance are just the back story to the various story threads. We have the smugglers operating near Acapulco, General Musso running the USA naval base in Guantanamo Bay, the female assassin Caitlinon assignment in Paris, James Kipper the City Engineer in Seattle, the war reporter Bret Melton based Qatar and Admiral Ritchie based in Hawaii. I’m also being remiss in not mentioning that the story is set in March 2003, just as the coalition forces were about to invade Iraq. The majority of coalition forces were, of course, American and so were stationed outside of the wave when it struck. The USA also had other military bases outside of the wave impact area, so the military are in surprisingly good shape. That’s a good thing as this is essentially a military tale. The action varies from large scale US engagements to the smugglers shoot out with another gang to our lone assassin’s mission. The book really excels in two areas. The first is extrapolating on the consequences of the USA economic powerhouse suddenly disappearing. The effects portrayed are extensive and some catastrophic but all are plausible. France, for example, descends into civil war which makes the American assassin’s assignment a bit harder than it would have. The impact on the Middle East is even more extreme as the US troops attempt to withdraw. The other area I thought was well-written was the various military engagements. They are not for the squeamish and there’s no miraculous protection for the good guys in a fight. Against this background of the world trying to deal with the disappearance of America, we have the various sub-plots where all of the characters have to adjust to the new world order. The various sub-plots are not intertwined, although some of the characters do make appearances in other sub-plots. Each of these sub-plots could have been a novel in their own right with the wave being the thread that binds them together. The action and there’s a lot of it is fast and furious. These bits are very well-written and keep you glued to the book to see what happens next. Where the book disappointed me was the wave. There is very little information about it other than it appears and seems stable. There are some reports that it reaches out to ‘grab’ people who come to close to it. These unlucky people are never seen again. There are a couple of times where the scientists report back but they are only reporting that there is nothing to report. Their instruments don’t detect the wave at all. They are as mystified about the wave as I am and I’ve read the book to the end. Perhaps I have grown accustomed to a standard plot model where the mystery is resolved by the end of the story even if it goes to multiple volumes. There is, of course, the sequel to this book titled ‘After America’ and we are given a six and a bit page excerpt from it at the end of ‘Without Warning’. That excerpt didn’t lead me to expect any resolution to the mystery of the wave but I’m going to read it anyway. « Marvel’s The Defenders last trailer.